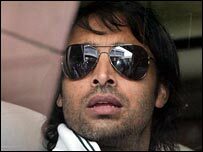 Paceman Shoaib Akhtar has protested his innocence after failing a drugs test for a banned anabolic steroid. Shoaib and team-mate Mohammad Asif tested positive for nandrolone. But the 31-year-old said: "I have not knowingly taken any performance enhancing drugs and would never cheat my team-mates or opponents in this way. He told his official website: "I have always played the game fair and I give 100% and do not feel that I need to take drugs to help my bowling." Pakistan coach Bob Woolmer said he was shocked and disappointed when he heard the news but pledged his team would carry on in the tournament. "I have never come across anything like this in my life. We will have to be strong in these situations," he commented. The pair recently returned after long-term injuries. "I'm just wondering whether the substance that has been found was in one of those injections they use for those injuries," said Woolmer. He admitted it had been a turbulent six weeks for the Pakistan team, following the forfeited Oval Test fiasco and its repercussions. "When you're in a hurricane it is pretty stormy and I guess we are in a bit of a hurricane now but we'll get through that. "Cricket has to come first, regardless of what individuals do and we know we are trying to do the right things. It's bad timing but that's the situation. "We've just got to put aside and get on with the Champions Trophy." Former Pakistan captain Asif Iqbal has urged the Pakistan board to take a hard line if the test results are confirmed by the findings from the B samples. "There should be no place whatsoever in any sport for people who take these performance enhancing drugs. They should just be told, 'That's it, there's no place for you'," he told the BBC. PCB head of cricket operations Saleem Altaf said they were expecting the result of the two players' B samples on Tuesday. "As per the preliminary test, the PCB has asked for reconfirmation of the test from the Malaysian laboratory and the results are expected by tomorrow," he said. "PCB has decided to withdraw the two players from the ICC Champions Trophy immediately and they will return home on the first available flight." England batsman Andrew Strauss said the news had rocked cricket. Speaking on BBC Five Live, he said: "When drugs are used in any sport it is not a great day for that sport and this not a great day for cricket. "The process has got to be gone through and proved. That is the situation and if bans are in place that has got to happen I think. "I don't think it is very common in cricket. I have not heard of it in any team I have been playing in." England have had a drugs testing system in place for 20 years. "I am delighted so far in England we have not had this type of issue. We have had a some recreational drug issues down the years but we work very hard with the PCA [Professional Cricketers Association]," said ECB chief executive David Collier. "Every single cricketer in England and Wales, every first-class cricketer, every academy cricketer, got a one-to-one visit as part of a drug education programme. "That programme is absolutely critical and it is something we are getting much better at. The ICC are copying the English system."